Today's game I first heard about when Dice Hate Me interviewed it's creator Brian Kowalski. After this, one of my friends mentioned that she had seen it at GenCon, and so I investigated it further. Ladies and gentlemen.... Cookie Fu!!!! In Cookie Fu, each player creates their young fighter and can mold them by selecting different special moves for them to perform and different dice to use throughout the duel. After the setup, players roll their dice each round to determine initiative (there is a special die for this). After initiative has been determined, players roll all of their remaining die (and I can tell you from experience, the more dice you use the more fun the game is). The result of the die rolls determine what each player can do each turn. They now alternate attacking (and defending) each turn with basic puches, kicks, and super-amazing ridiculously-powerful cookie-shattering Chi moves (this is my favorite part and the main reason the game is better with more dice). The game continues in this way until one of the players is knocked out - at which time the winner should gloat and laugh at the poor crushed victim who apparently needs to practice his Cookie Fu more (though I would encourage the trash talking to occur throughout the game and not just at the end). So, Cookie Fu is a fun little pointless game... wait... I just called a game "fun" and "pointless" in the same sentence. I guess I should re-evaluate what I play games for; I think it actually is for fun! Therefore, Cookie Fu's first pro is that it is really fun. And, like I said earlier, the more dice you have, the more fun it can be. With 5-6 dice per person (we were splitting a single player pack), the game isn't really much fun. With 12-13 dice per person, where you are able to get enough Chi to do crazy over the top moves, the game is a huge blast! The next pro for Cookie Fu is theme. Now, I personally don't really care anything about theme in games; if a game has a theme, great, but if it does not I'm fine with that, too (I'm just as happy playing Battlestar Galactica as I am playing Yinsh ). But, if the theme is awesomely implemented, it can be wonderful! The theme for Cookie Fu is "bad Chinese take-out spoof" (I at least hope that's the theme - otherwise, I suppose me writing that could be fairly offensive). The game comes in a Chinese takeout box, the special moves come in fortune cookies (yes, they are edible), and all of the special moves are essentially jokes about Chinese food stereotypes. 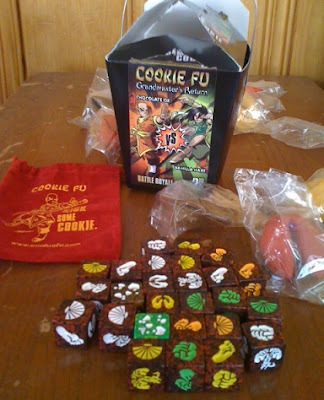 There have been a lot of collectible-style fighting-ish dice games to come out, but what really sets Cookie Fu apart is the hilarity of it's theme. Now for a quick discourse between pros and cons. How do we really determine how good a game is? Is it based on number of plays, hours of play, strategic depth, or something else entirely? I would say that one of my preferred ways of measuring this is in number of plays. Now, I realize that this will greatly favor short games, as it is much easier to find table time for them, but I accept that limitation. With that said, I can see Cookie Fu getting continued table time for several years to come since it is a very light, fast, and more importantly, fun game. I'm still not going to rank it in my top 5 games of all time or anything like that, but I can see it occasionally being in the top 5 games that I play in any given 3-month period. Now for the cons of Cookie Fu. First, I'm not really a fan of "collectible" games. Fortunately, Cookie Fu isn't collectible in the "I need to own them all or my life is incomplete" sense (like Magic). However it is collectible in the sense that different dice are made differently and so you can customize your characters before fighting and such - but to do this, you must have enough different dice that you have these options (read "buy more dice"). Instead of customizing our characters, what we honestly found to be the most fun was to simply use all of our dice each game; maybe once we have played it more (and/or bought more dice) we will pull some of them out and focus more on the customizing aspect. The saving part of the collectible aspect of this particular game is that you can get enough to play a solid game with the 2-player with a "Battle Royal Pack". From there, if you buy a few booster packs, you should have enough dice to play a really fun game of "the 'Fu". The other "con" (nah, we'll call this a neutral point of note) is that the game is not very deep (you know, in case you missed that earlier). Fortunately, there is at least some strategy in determining when to attack, and moreover in how to use your multi-use dice; should grabs be used on offense, or on defense? Should you use Chi dice separately or save them up for a cool move (or even use them to heal)? But if you don't have enough dice in the game, then the cool Chi moves won't be much of an option and so it can feel like just alternating punches back and forth. Finally, this game isn't for everyone. I think that there will be tons of people that can find great joy in playing Cookie Fu. And I would enjoy playing with them as well. However, if I brought this out to try to play with some of my more strategy-focused gaming friends, they will give me the "what's wrong with you" blank stare. Oh well - to each his own. Overall, I give Cookie Fu an 8.5/10. This is on the extreme high side of what I debated in my mind (and possibly influenced by the fact that I think I give out too many 8.0's), but ultimately, I think that Cookie Fu completely fulfilled everything that it was trying to do. It was not made to challenge Puerto Rico as one of the most strategic games of all time - it was closer to trying to challenge Fluxx as one of the most fun, quick, and lightweight games. And I think that it did an exceptional job. Final point of note: have you not checked out Dice Hate Me yet? You really should - Chris does lots of really cool interviews; and now he even has his own podcast! Point of note after the final point of note: Have you subscribed to my site yet? You really should - I'm on Facebook, Twitter, and even offer a full-text RSS feed for your favorite Reader. I would like to thank Blue Kabuto for providing me with a copy of Cookie Fu to review.